The Ninja Turtles have proved enduringly popular since their 1990s introduction, with the recent blockbuster movie release cementing their status as classic comic book characters. However, this rather bizarre entry into their history focuses less on the kind of action-oriented shenanigans that they are best known for and instead allows fans to indulge their artistic side for a change. 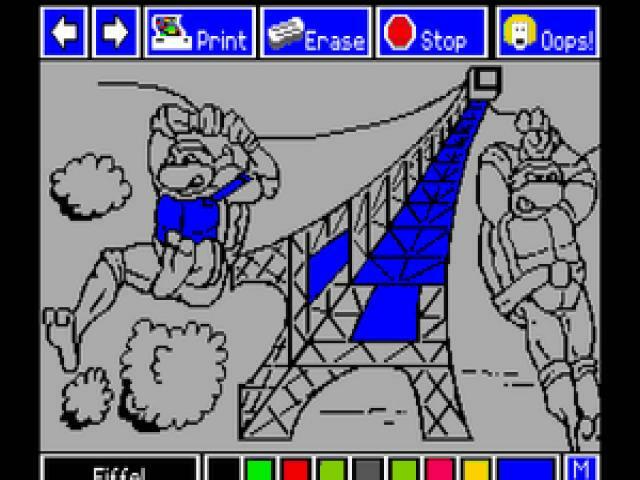 The game takes the form of a sort of interactive colouring book, where the various turtle characters get to travel the world in peace for a change, enjoying the sights and sounds of a number of famous landmarks. 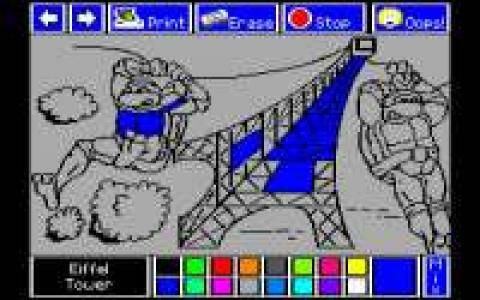 Their travels take them to the likes of Stonehenge, the Kremlin, the Taj Mahal and the Alps (where they engage in a spot of skiing rather than the usual skateboarding) and it's up to the player to make these adventures more interesting by adding colours to the scene in order to complete them. There's a reasonably extensive palette of colours to choose from while the interface is easy to pick up and get the hang of. Unfortunately, the actual painting is a little limited, utilising a colour fill approach only, so Turtles fans who are really looking to stretch their creative muscles won't find a great deal to challenge them here but for younger followers, this is a great introduction to the joys of painting, computers and even geography and it certainly is quite a joy seeing the pictures come to life. The range of scenes also adds to the appeal with their descriptions boosting the educational content a little, so if you're looking for a way to keep a Ninja Turtles follower quiet, you could do worse than this. For a more action-oriented slice of fun, check out the original Teenage Mutant Ninja Turtles game, The Arcade Game or The Manhattan Project.